Drought doesn’t scare me to pieces. My plants have been through it all and always come back for more. Yes, I do water some, but not outrageously. I avoid thirsty ones and go for those that can take our brutal swings. What scares the living daylights out of me is overreaction to drought. I keep seeing people make a clean sweep of it all and dumping yards of rocks over former living ground. Aside from being hot, hot, hot, and a mess when “weeds” inevitably find a niche, what about the wildlife we banish? New Mexico landscape architect David Cristiani is very familiar with this frightening response. He made the trip to Austin to join Tom for his insightful perspective to steer us away from ecological disaster. Follow his insightful blog, The Desert Edge, for more of his perceptions. Some plants thrive in rock, for sure. But a lot do not, like many of our trees and native plants! If we force them into unnatural habitat, what happens? Okay, bet you got that one: death. Hot, ugly, and not much life in sight, other than the person who comes to blow debris off the rocks: is that how we want to deal with drought? Nope, says landscape architect Christy Ten Eyck, who lived in Phoenix for many years. Now, she’s in Austin, keeping busy designing across state lines around the country with her important message to keep our wildlife intact. 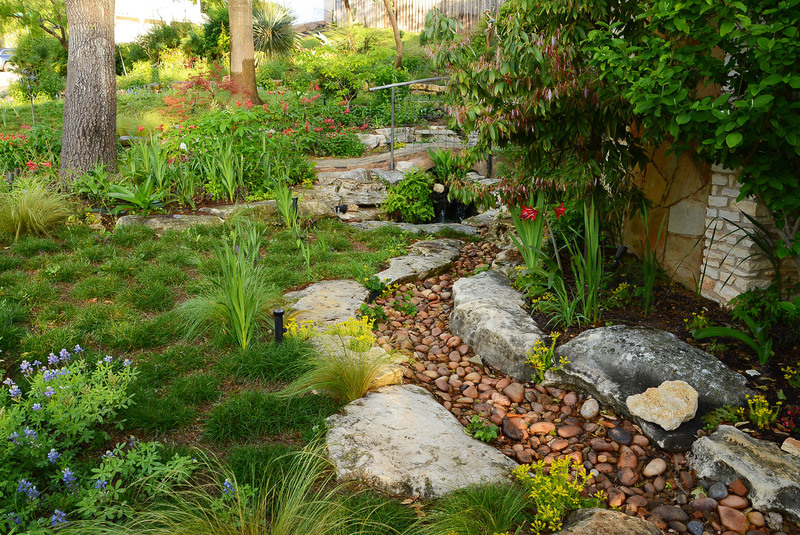 On tour in her Austin garden, see how she connects the drought dots without sacrificing essential content, like our lives! Christy’s garden includes many clumping grasses. These drought tough plants, like Lindheimer muhly, are superb standouts for texture, structure, and striking seed heads. Most of them go dormant in winter. So, when should we prune them and how far down do we cut? Daphne gives us the cutting edge scoop. We want to keep them up as long as possible, since their seed heads, like those of Gulf muhly, are still gorgeous in this mild winter. I think they look great in their winter rendition! Butterflies agree, since overwintering ones hide in the leaves to stay warm. Some birds go for the seed heads, too. Daphne explains that we do want to cut them back by the end of February to clean up before new growth emerges. With inland sea oats, cut all the way to the ground. I cut some of mine already to show you how their new leaves are already popping up. Strappy ones, like Mexican feather grass, get a straight haircut to about 6” above ground. Get Daphne’s techniques to make the job easier on large plants like Lindheimer muhly. Cut this neighboring Mexican bush sage (Salvia leucantha) down to the rosette. A chore we can’t delay is wrangling those weeds! With the low rainfall, they’re not as crazy as in wet winters, but even a few mean a lifetime supply if we let them go to seed. See how Merrideth Jiles from The Great Outdoors snags them. Now is also an excellent time to plant trees before it gets hot in earnest. Take a look at Daphne’s Pick of the Week, Mexican orchid tree, (Bauhinia mexicana), if you’re looking for a small shrub-like tree in dappled light. Like Christy, plant it where you can see the butterflies and hummingbirds that flock to its flowers from summer to early fall. And you’re good to go in deer country, since (usually) they won’t bother it.